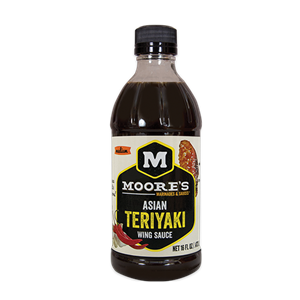 Savory teriyaki flavors, sweet garlic, ginger, and spicy pepper. Soak for a quick marinade or drench for a down-home dip. This product has a "Best By" date of 07/20/2019 and being sold at a reduced price. High fructose corn syrup, water, soy sauce (water, wheat, soybean salt, less than 0.1% sodium benzoate used as a preservative), sugar, distilled vinegar, modified food starch, xanthan gum, ground red chili peppers, ground ginger, garlic powder, cellulose gum, sodium benzoate and potassium sorbate (added as a preservative), minced garlic, garlic oil, silicon antifoam.